New research on the Antarctic ice shelves has shown that massive waves from the ocean have accelerated the calving away of ice shelves, causing massive ice loss. Storm fuelled ocean waves slamming against the Antarctic ice shelves has caused catastrophic ice loss over the last few decades. New research on the Antarctic ice shelves has shown that reduction in ice coverage since the 1980s eventually led to an increased level of exposure of ice shelves to ocean water and swells on the Antarctic peninsula. This has been found to cause the shelves to flex and break off in large quantities. Lead author Dr Rob Massom, of the Australian Antarctic Division and the Antarctic Climate and Ecosystems Cooperative Research Centre, exaplined the scenario in a release. "Sea ice acts as a protective buffer to ice shelves, by dampening destructive ocean swells before they reach the ice shelf edge." "But where there is loss of sea ice, storm-generated ocean swells can easily reach the exposed ice shelf, causing the first few kilometres of its outer margin to flex." This eventually causes "calving" – slivers of expanding cracks that make existing fractures larger and finally break off as ice cannot flex beyond a certain point. Like that final straw that broke the camel's back, says Massom, this triggers the runaway collapse of large volumes of ice, "from shelves weakened by pre-existing fracturing and decades of surface flooding." This finding, says Luke Bennetts from the University of Adelaide, highlights the need for ocean waves to be factored into ice sheet modelling. As the climate changes, making more accurate measurements becomes a lot more important as Antarctic ice is a major contributor to global sea level rise. He also explained that accuracy is needed in modelling because of how the Antarctic ice sheets are, as of now, the single greatest source of uncertainty in projections of sea level rise around the world. About three quarters of the Antarctic coast is lined by ice shelves and they play an important role in controlling sea level rise by slowing glacial movements from the inside of the continent all the way to the oceans. Only a few weeks back reports of under ice valleys and mountains were found and they are beginning to speed up the ice movement in the region because of the way climate change is changing ice dynamics down there. Also, tectonic movements are active near the south pole, not very good news for the already fast moving ice. 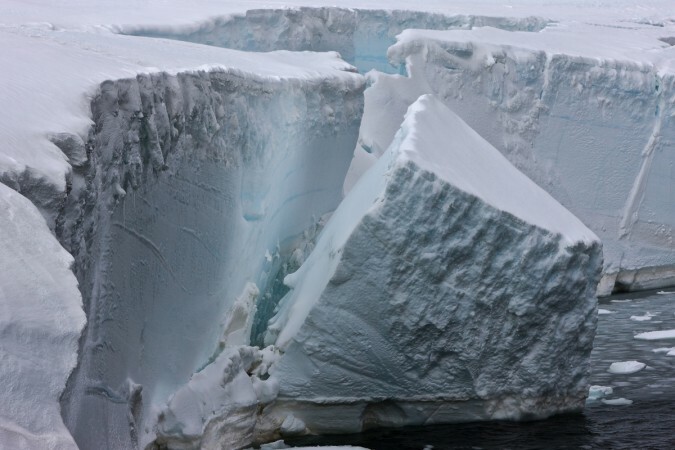 "While ice shelf disintegration doesn't directly raise sea level because they are already floating, the resulting acceleration of the tributary glaciers behind the ice shelf, into the Southern Ocean, does," explained Bennetts. The discovery was made by a multinational team consisting of researchers from Australia, the United States and New Zealand, notes the release. The team created a model that combined surface and ocean wave data with satellite images which they used to study five ice shelf disintegrations that happened between the years 1995 and 2009. The study included the abrupt breakaway of 1450 square km of ice from the Wilkins Ice Shelf in 2009, the 1,600 square km of ice off Larsen A Ice Shelf in 1995, and the 3320 square km loss from the Larsen B Ice Shelf in 2002, notes the release. Each of these events happened when the ocean waves were really large. The Larsen-B collapse in 2002 cleared out a region in a matter of days that stood steady for about 11,500 years before it.